A cosy apartment perfect for families with a large terrace. 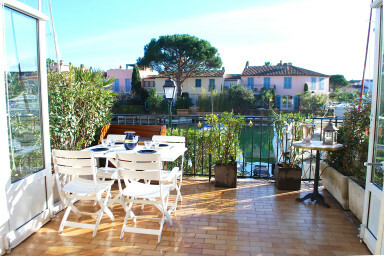 Superb apartment entirely renewed in Port Grimaud 3, close to the main place of Port Grimaud South and the facilities. This lovely apartment has got two large terraces with a beautiful view on the canal. On the lower level, a bright living-room with a well-furnished open kitchen, a large cabin-bedroom with two single beds that can be gathered and a shower-room. On the upper level, a bedroom with a sofa-bed (very good mattress) leading to a nice terrace, a cabin-bedroom with bunk beds and a shower-room. AIR-CONDITIONING in the living-room and the bedrooms. The terraces are well furnished to help you spend very good holidays. A nice and comfortable apartment with great services.